UPDATE: Just an availability update — DRY will be in the wine departments of your local QFC as well as Larry’s Markets in the coming weeks. I don’t know much about this company or where you can get the bottles, but what I do know is that these drinks are really refreshing. I went to a grand opening party last night where they had all the flavors available. We’re talking flavors you never have seen in Soda form… KUMQUAT, LAVENDER, LEMONGRASS and RHUBARB. I didn’t want to look like a dehydrated freak, so I only tried the LEMONGRASS flavor. I’m not really a flavored tonic water lover (like Talking Rain), and it should not be confused with that stuff either… this is much more sophisticated. More like exotic flavored and lightly sweetend S. Pellegrino. 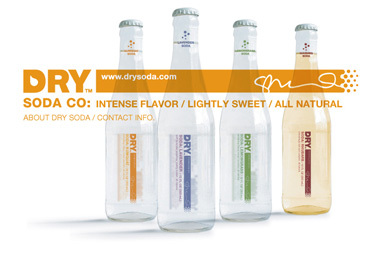 I think DRY just created another type of drink category and it’s actually amazingly good. It’s refreshing to see a drink that has flavor and sweetness with out all the chemicals. “DRY is all-natural, non-caffeinated, flavored with fruit and herb extracts and sweetened with a small amount of pure cane sugar”. I think it should be a hit amoung the ladies that monitor their caloric intake since the drinks only contain 50-70 calories in each serving. Now I just need to find out how I can get a case (or five) and make it my summer drink of choice! UPDATE: Just got of the phone with Sharelle Klaus, of DRY SODA CO., which, coincidently, are located in Tacoma, WA. about 45 mins south of Seattle. The product line just launched last week and are only available in select fine restaurants here in Seattle. I recommend you go to your local fine grocer and ask them to stock this drink, today!